A 71st minute goal from Jamie Coughlan clinched a hard-fought victory for Cork over Kilkenny that ensures they will play in Group A of the Allianz Hurling League Division 1 for 2020. Group A will now consist of Limerick, Waterford, Tipperary, Galway, Cork, and Westmeath, while Group B will be made up of Clare, Wexford, Dublin, Kilkenny, Carlow and Laois. It took the Rebels some time to find their rhythm in this match though with Kilkenny the more clinical side in the first-half. While Shane Kingston had the opening point, it was Kilkenny who played against the breeze that were more economical in front of goal and buoyed by a penalty goal from Eoin Murphy, the “Cats” led by 1-8 to 0-6 at half time with Cork posting eleven first half wides. Whatever John Myler said to Cork at half time seemed to have the desired effect as Cork upped their work-rate in the second-half and had the gap closed to just two points by the 50th minute. They then drew level when rising star Jack O’Connor cracked home a sweet goal to leave the scores reading 1-11 apiece. In a helter-skelter finish it looked like Kilkenny had a winning momentum when points from Richie Hogan and James Maher pushed them three ahead. Cork hit back with two points of their own from Conor Lehane and Mark Coleman before Coughlan struck for what proved to be the decisive score of the match moving Cork two points clear. Both sides added a point each, but it was Cork that ran out the winner to secure their group A status for next year. Cork: C Lehane 0-8, J Coughlan 1-0, J O’Connor 1-0, S Kingston 0-3, L Meade 0-2, M Coleman and C Murphy 0-1 each. Kilkenny: E Murphy 1-4, R Hogan 0-5, N Brassil 0-3, R Leahy 0-2, J Maher and B Ryan 0-1 each. and J Coughlan for S Kingston. and M Keoghan for R Leahy. Looking back the result in the overall scheme of things might not be too important but coming on the back of a hammering from Tipperary, it was important for Cork to get the win on a day that saw Dublin surprise Tipperary in Thurles. 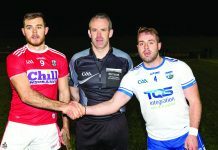 When both Cork and Tipperary meet on May 12th in Pairc Uí Chaoimh it will be whichever side that performs on the day that will come out on top. The League overall has been a mixed bag for Cork who will now see the players return to their clubs for a few weeks before re-grouping for what promises to be a thrilling Munster hurling Championship.